It can be hard to start any new task – fitness is no different. This time of year, many people are looking for tips for starting a new fitness routine and I can relate. I think it can be extra challenging to start a new fitness routine in the winter when the days are short, dark and everything can just feel blah. Last year I wrote a post celebrating the gym newbie and if that is you, I hope you’ll read it. But I suspect that many of you aren’t necessarily newbies but maybe just lacking motivation to start that training plan or fitness routine during these winter days. 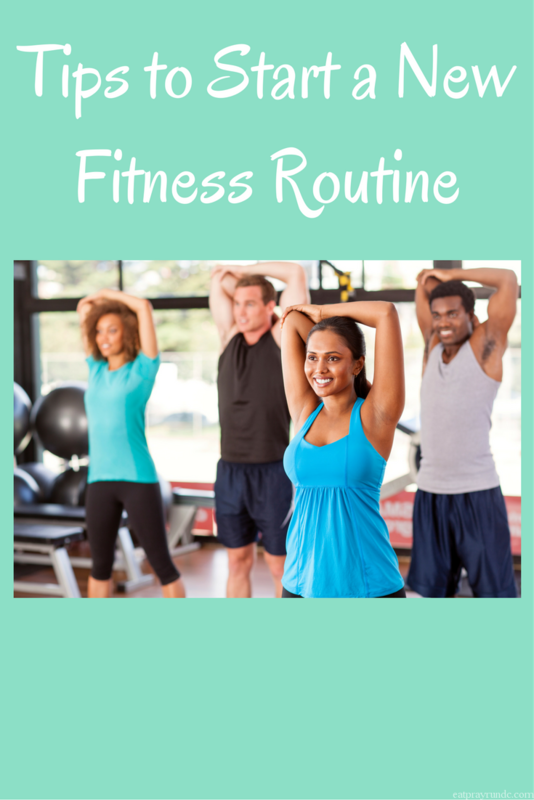 And so I wanted to share a few tips from me and some of my blogging buddies for starting a new fitness routine. Just go. The hardest part is often just getting out the door. Put on your workout clothes, leave the house and go the dang thing! Tell yourself that if it’s awful you can quit after ten minutes. Chances are, after ten minutes, you’ll want to keep going. I’ve done this a thousand times and never quit after the ten minutes. Set out your workout clothes the night before (or that day if you are working out after work). Lay everything out so you don’t have to think, you can just GO! Follow a couple of inspirational folks on Instagram who typically workout the same time as you – check their posts and see that they’ve got their workout in to motivate yourself to get out the door. Note that this only works if you’ll actually put your phone down and GO! Are you looking for even more encouragement and support? Join my private FB Group where we do different challenges to encourage each other! Would love to have you! All great tips! Its amazing how much motivation we can find on social media just from being supportive of one another. I totally agree – that’s for letting me share your tips! I really love the tip about finding something you love and “running” with it. Hey, see what I did there? 😉 You love running, but me? Not so much. I will still go for runs, but not as much as I will be lifting weights or kickboxing. The cool thing is as our fitness levels increase so will our interests and horizons. It’s easier to stick to something you actually get an accomplished feeling from. I totally agree! Thanks for letting me share your tips! Great tips! I definitely am motivated by seeing what my friends on FB and IG are doing – if they can do it, I can too! I think focusing on progress, not perfection is key, especially when you are starting out. Missing a day is not “failing” – just go tomorrow. Progress not perfection – totally! Thank you for these great tips Courtney, I definitely have to follow them since I’m training for my first marathon, The Miami Marathon, on January 29. It’s so hard to get out of the door to run sometimes but Miami’s beautiful weather helps a lot. I am very exited for my first marathon and need to keep up the training. If you are looking to add to your marathon list of 2017, you should come to Miami, it’s only a couple of weeks away.